Whenever there is a party or family gathering with a variety of appetizers, somehow the nuts seem to be nibbled on the most. Nuts are easy to grab, not very messy, and taste good with all kinds of beverages. 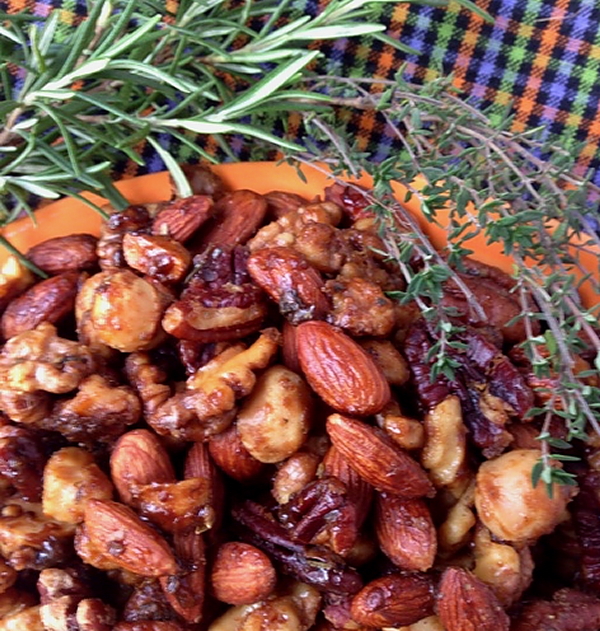 With these roasted herbed nuts, you won’t need any other appetizer because people will go crazy over these. Or maybe they will go nuts. Sorry. 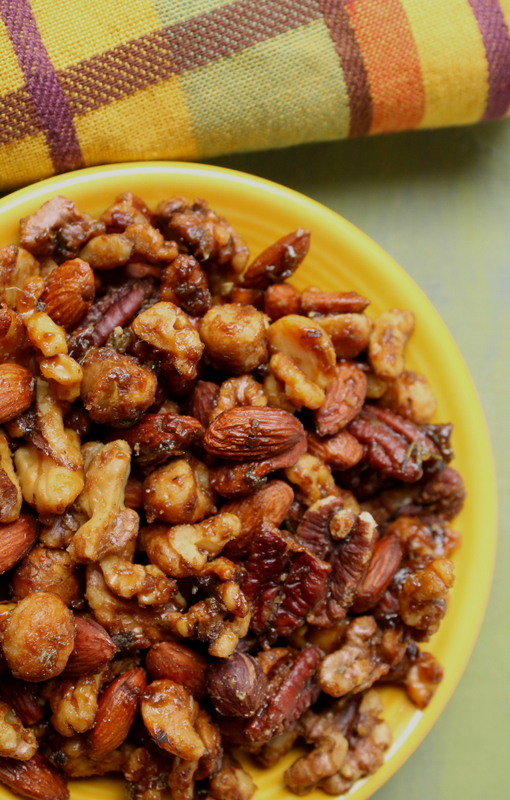 The nuts are easy to prepare plus you can make them a day or two before a party. Four kinds of nuts are spread out on a rimmed baking sheet, then coated with a mixture of fresh herbs, maple syrup, olive oil, and sea salt. As they are roasting, the aroma of the herbs will permeate the kitchen; and they taste as good as they smell. 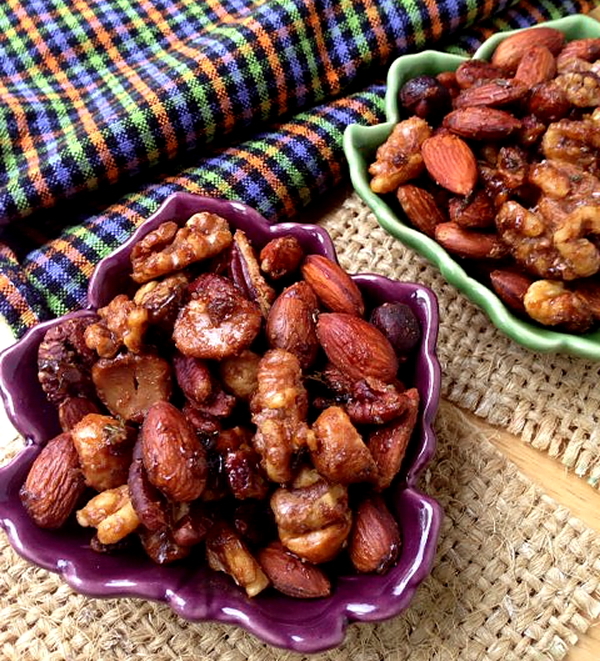 The nuts also make a great hostess gift by placing them in pretty containers with ribbon. Don’t forget to attach the recipe because it is guaranteed people will want it! Heat oven to 3oo degrees F. Place the walnuts, almonds, pecans, and macadamia nuts on a 10-by-15-inch rimmed baking sheet. In a small bowl, stir together maple syrup, olive oil, thyme, sage, oregano, rosemary, marjoram, and cayenne pepper. Drizzle over nuts in pan and toss to coat nuts well. Sprinkle evenly with the sea salt. Bake for 45 minutes, stirring every 15 minutes, until nuts are golden. Let cool in pan, or you can transfer them to a work surface covered with some parchment paper for faster cooling time. Makes 5 cups. The nuts can be stored in an airtight container for three days, or you can even freeze them for up to a month. *You can use dried herbs in place of the fresh, but they won’t taste quite the same! If you use dried, use 1/2 teaspoon of each herb. Other amounts stay the same. The nuts always give me a good excuse to bring out those cute leaf-shaped little bowls. I scatter them around the room at parties. This just might be the most perfect hostess gift. Thanks for sharing. I love these as hostess gifts for the holidays and make them every year. People love them! I’m definitely going to make these – what a great idea to add fresh herbs! What a great counterpart to the richness of the nuts and sweet maple. Yum! I hope you like them, Kellie. We can’t get enough around here. Be prepared for the most intoxicating aroma while they are roasting!